The Charlotte Observer, founded in 1869, has the largest circulation of any newspaper in North Carolina. A consistent advocate of economic progress in Charlotte and the surrounding region, the paper, in the mid-twentieth century, also became a strong voice for racial and gender equality in the South. At the close of the Civil War, four Confederate veterans and now-unemployed printers moved to Charlotte from nearby towns and began doing business as Smith, Watson & Company. Their firm first issued the Observer on 25 Jan. 1869. Unlike many other newspapers, this publication was politically independent and tended to avoid the controversies of the day. Nevertheless, the paper clearly disapproved of Reconstruction, the policies of Reconstruction governor William W. Holden, and the Fourteenth and Fifteenth Amendments. 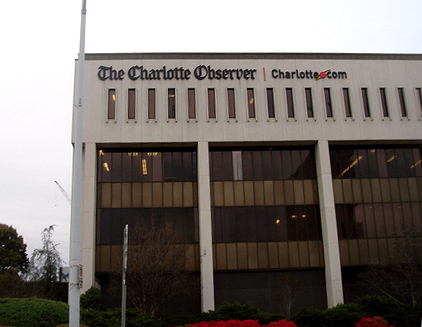 From the beginning, the Observer linked its future to that of Charlotte and the Piedmont Carolinas. In September 1872 James H. Smith, the last of the four founding printers to retain an interest in the Observer, sold the paper to Johnstone Jones, a lawyer and newspaper publisher. Jones's progressive editorials promoted industry and commerce, public schools, and public improvements. They envisioned a reviving South, a conception soon embraced in the New South creed pioneered by Henry W. Grady's Atlanta Constitution and Henry Watterson's Louisville Courier-Journal. Jones also introduced telegraphic news, replaced a hand press with a rotary press, and, by hiring Joseph P. Caldwell as city editor in 1872, greatly enhanced local and regional news coverage. In the depths of the depression caused by the panic of 1873, the Observer was sold in the spring of 1874 to Col. Charles R. Jones and Fred H. Pendleton. Restless under the stand-pat policies of state Democrats, Jones editorially applauded the rise of independent journals across the country and the advantage they enjoyed over party newspapers. He continued to openly fight against Democratic leadership and early in 1886 announced his candidacy for Congress as an Independent. Acting on the advice of Democratic leaders, William S. Hemby founded the Charlotte Chronicle (March 1886) as an evening alternative to the morning Observer. Hemby's paper soon switched to a morning daily in order to compete directly against Jones and the Observer. The strategy worked, and the Observer ceased publication on 1 Aug. 1887. When the Chronicle's fortunes began to decline, the paper was sold (in January 1892) to Joseph Caldwell, the former city editor of the old Observer, and Daniel A. Tompkins, an engineer, financier, and promoter. On 13 Mar. 1892 the Chronicle appeared without warning as the Charlotte Daily Observer. With Caldwell as editor and Tompkins as publisher, the Observer underwent an expansion that propelled it from country reporting to modern journalism. The two men recruited a staff of fine writers and reporters; installed the latest news-gathering and printing equipment; broadened coverage to include books, music, drama, finance, architecture, and medicine; and made their paper a vigorous advocate of education and industrialism. They promoted manufacturing but opposed labor unions, urged a diverse agriculture but rejected the agrarian Populists (who supported William Jennings Bryan for president), and befriended individual blacks but endorsed white supremacy laws that denied blacks the right to vote and ultimately produced a harsh segregation. Caldwell, as editor, maintained extremely high editorial standards, and by 1904 the Observer was considered the state's best newspaper. In June 1912, a few months after Caldwell's death, Wade Harris was appointed the paper's editor, a position he held until his own death in 1935. His editorials, however, were never as forceful as Caldwell's; often they were mere news summaries with scant opinion. After Tompkins died in October 1914, the paper was briefly owned by two bankers, George Stephens and Word H. Wood, founders of the American Trust Company. They sold the Observer in 1916 to Curtis B. Johnson, owner of the Knoxville Sentinel and widely admired as a conservative southern publisher. (That year, "Daily" was also dropped from the paper's name.) Under Johnson, the Charlotte Observer became the largest newspaper in the Carolinas, with circulation rising from nearly 13,000 daily (over 16,000 on Sundays) in 1916 to about 134,000 at the time of the publisher's death on 6 Oct. 1950. Johnson made these gains by modernizing the paper's plant, expanding its delivery system (and consequently enhancing Charlotte's reputation as a distribution center), and improving its news coverage and features. His efforts to make the Observer the newspaper of record in the Carolinas earned it the appellation "the New York Times of the South." Johnson's widow then assumed active leadership of the Observer. At her urging, it became one of a handful of southern newspapers to react positively to the U.S. Supreme Court's landmark decision, Brown v. Board of Education of Topeka, on 17 May 1954. The paper's call for compliance was another step in its long, slow departure from the South's oppression of blacks, and it helped to strengthen the climate for moderation in Charlotte. In 1955 the Observer was bought by Knight Newspapers, Inc. (which became Knight-Ridder Newspapers in 1974), for $7.5 million, becoming one of several North Carolina papers owned by large conglomerates. 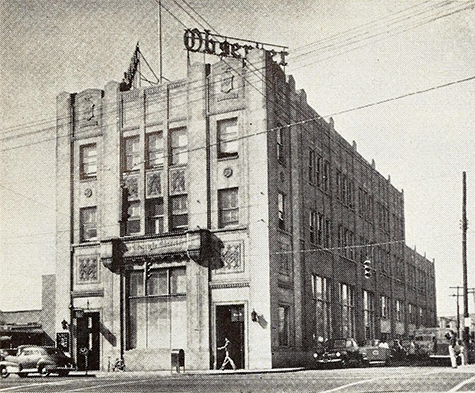 From 1955 to 1990 the Observer supplied editorial and managerial talent to many other newspapers across the country, including chief executive officers for Knight-Ridder and McClatchy chains; publishers in Philadelphia, Akron, Providence, Winston-Salem, and Anderson, S.C.; and editors in Wichita, Miami, Philadelphia, and other cities. The Charlotte Observer, through its constant promotion, has helped make Charlotte a business capital and the largest city in the Carolinas. The paper has also received high praise from the journalism community, receiving four Pulitzer Prizes-two for meritorious public service (its 1981 series on brown lung disease, which afflicted textile workers in the Charlotte area, and its 1988 coverage of the scandal surrounding the "Praise the Lord" ministry of Jim and Tammy Bakker). In the early 2000s the Observer had a daily circulation of about 235,500 (291,000 on Sundays), 1,200 employees, 5 regional bureaus in North Carolina (Hickory, Gastonia, Concord, Monroe, and Statesville), a regional bureau in York, S.C., and offices in Raleigh, Columbia, S.C., and Washington, D.C.
Jack Claiborne, The Charlotte Observer: Its Time and Place, 1869-1986 (1986). Bryant, H.E.C. "Personal Journalism, Editor Feuds, Half Century Ago." The E.S.C. Quarterly 9. No. 1-2. Winter-Spring 1951. p.24-25. http://digital.ncdcr.gov/u?/p249901coll22,451988 (accessed September 11, 2012). "Charlotte Observer Largest." The E.S.C. Quarterly 9. No. 1-2. Winter-Spring 1951. p.19. http://digital.ncdcr.gov/u?/p249901coll22,451988 (accessed September 11, 2012). Coffin, Oscar J. "Yesteryear Editors More Vigorous Than Today." The E.S.C. Quarterly 9. No. 1-2. Winter-Spring 1951. p.12. http://digital.ncdcr.gov/u?/p249901coll22,451988 (accessed September 11, 2012). Beasely, Roland F. "Personalities of Past Among North Carolina Editors." The E.S.C. Quarterly 9. No. 1-2. Winter-Spring 1951. p.10-12. http://digital.ncdcr.gov/u?/p249901coll22,451988 (accessed September 11, 2012). Stepp, Carl Sessions. "Caught in the Contradiction." American Journalism Review. April/May 2007. http://www.ajr.org/Article.asp?id=4305 (accessed September 11, 2012). "The Charlotte Observer." The McClatchy Company. http://www.mcclatchy.com/our-impact/markets/the-charlotte-observer (accessed September 11, 2012). "Resolution 30: A Joint Resolution Commending The Charlotte Observer on the National Recognition Accorded It for Excellence." Session laws and resolutions passed by the General Assembly. Winston-Salem, N.C.: Winston Printing Company. 1953. p. 1359. http://digital.ncdcr.gov/u?/p249901coll22,378306 (accessed September 11, 2012). "Modern home of The Charlotte Observer, State's largest newspaper. Recent extensive renovation and equipment cost in excess of a million dollars. Further enlargement of the building is planned." The E.S.C. Quarterly 9. No. 1-2. Winter-Spring 1951. p.24. http://digital.ncdcr.gov/u?/p249901coll22,451988 (accessed September 11, 2012). "The Charlotte Observer." Flickr user juggernautco (Daniel X. O'Neil). April 3, 2008. http://www.flickr.com/photos/juggernautco/2390682670/ (accessed September 11, 2012).